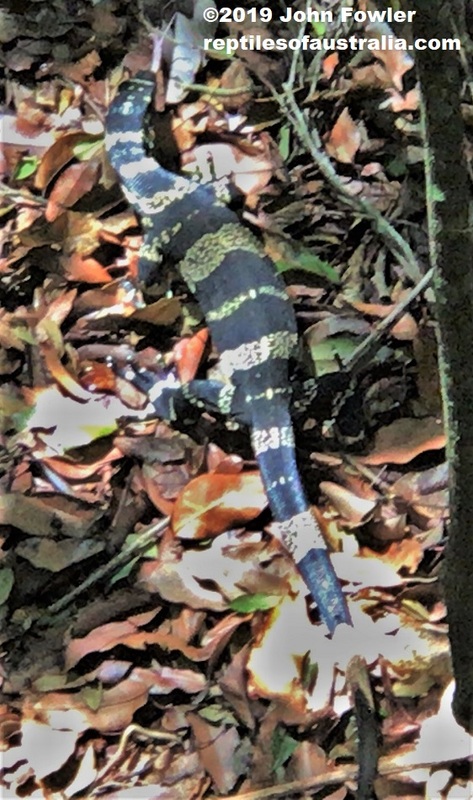 This Lace Monitor Varanus varius was hanging around a picnic area at Karawatha Forest Park near Brisbane in South East Qld - Note that Lace Monitors and some other large monitor species often hang around picnic areas. 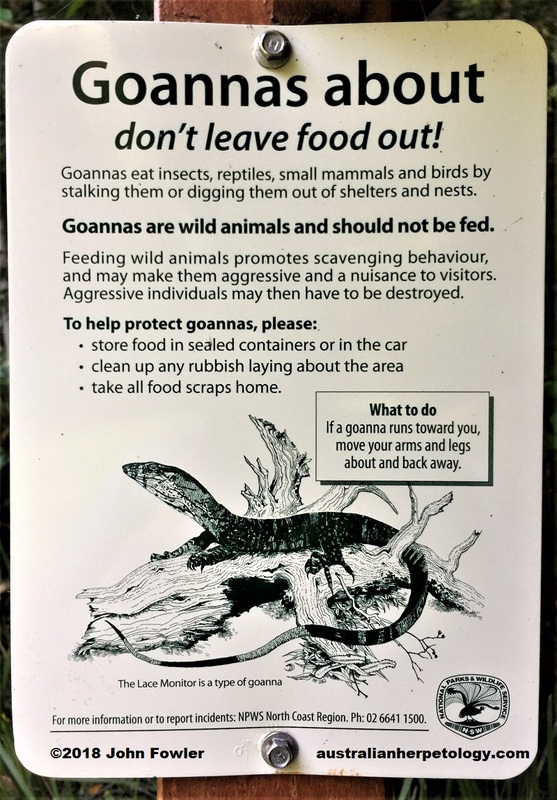 It is dangerous to feed them. 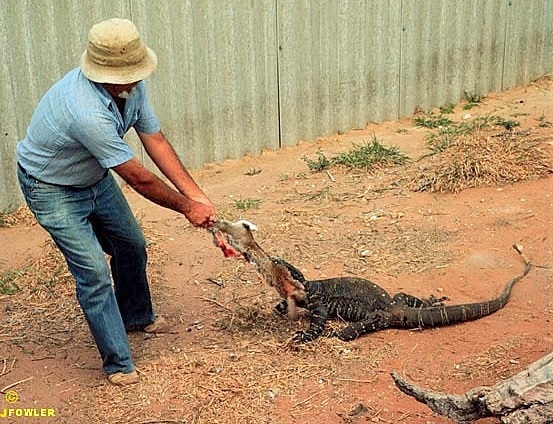 If someone reports a problem monitor to the authorities it is likely to be relocated. 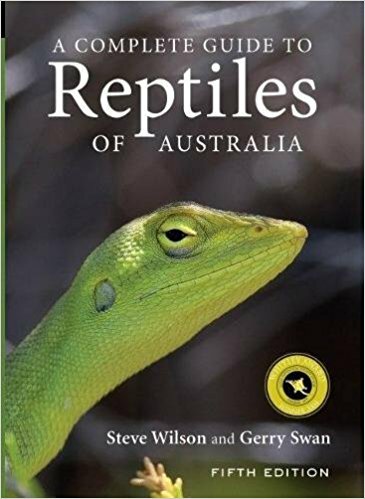 Note that large sharp bones like T-bones can cause serious injury to goannas as they try to swallow them, and should not be left where a monitor might find them. 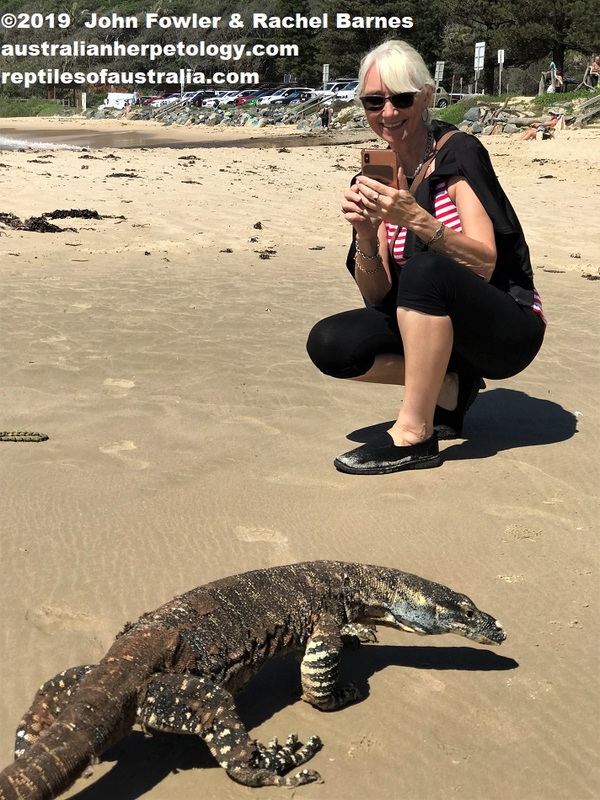 This large old Lace Monitor Varanus varius approaches Rachel Barnes on Shelly Beach, Port Macquarie, NSW to see if she has any food for him. 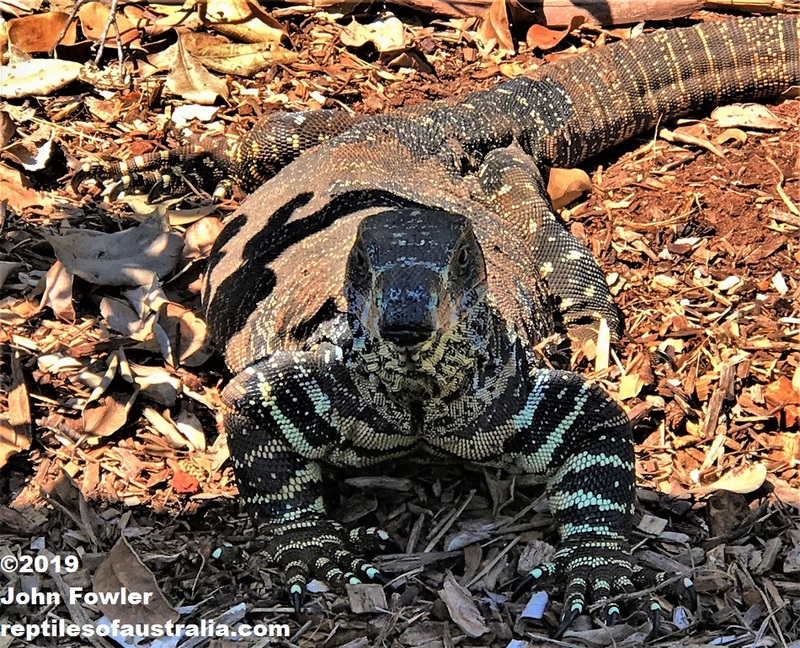 This goanna was fossicking at the waters edge, then walked to the nearby picnic area to fossick around the picnic area where 3 other goannas were also hoping to find food scraps! 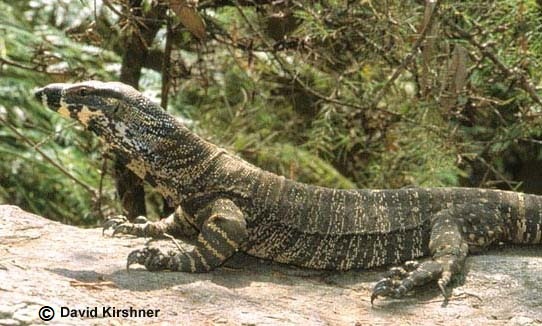 This very large and fat Lace Monitor Varanus varius was waiting by a picnic table at Shelly Beach, Port Macquarie, NSW. 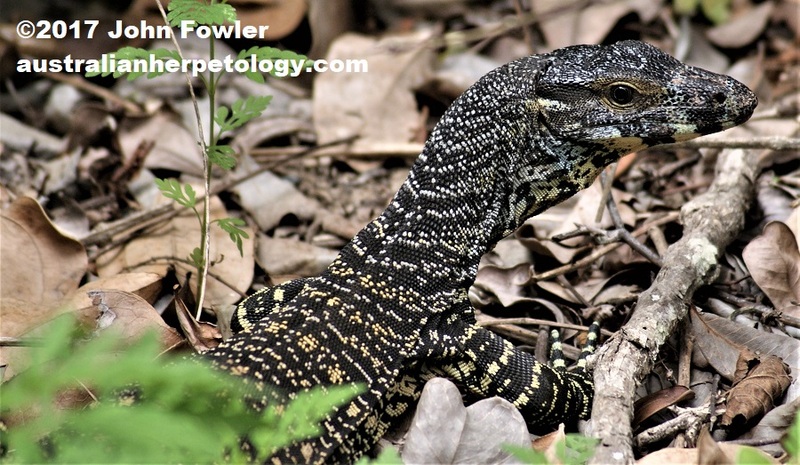 The Lace Monitor Varanus varius in the 2 photos above was photographed at Bongil Bongil National Park, NSW - it was about 1 meter long (3ft) seen crossing the road, it allowed us to approach it to take these photos. 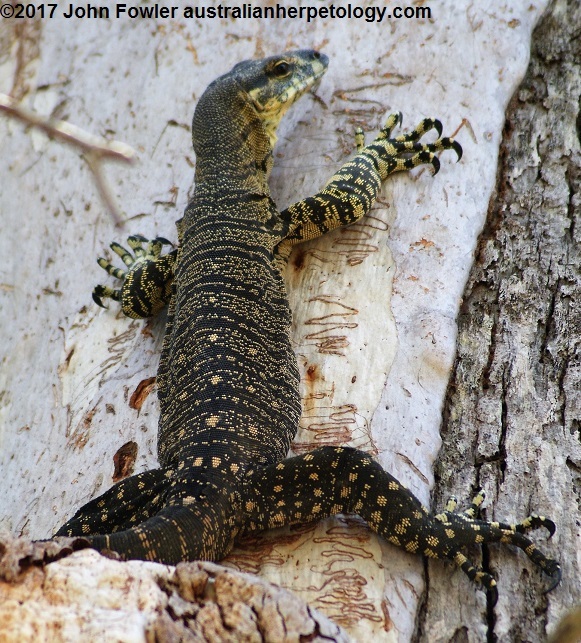 The Lace Monitor Varanus varius in the photo above was seen crossing the road at Bongil Bongil National Park, NSW. and it ran up this tree as soon as we stopped the car to avoid running it over. 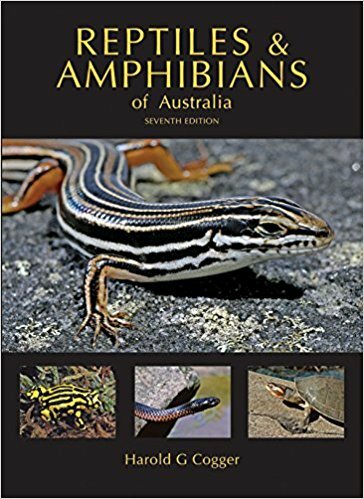 It was approximately 4 ft long (1.25 meters). 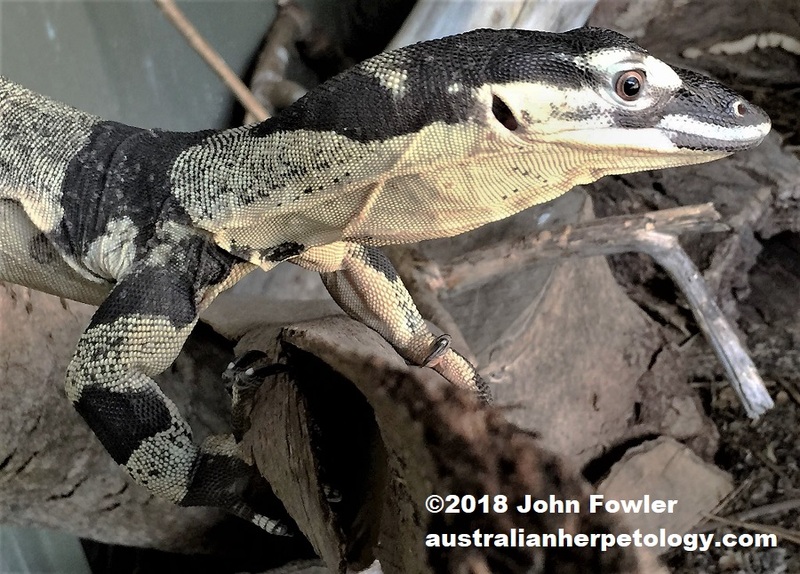 This hatchling Lace Monitor Varanus varius was given to the late George Cann (Jr.) as an egg found by a member of the public. 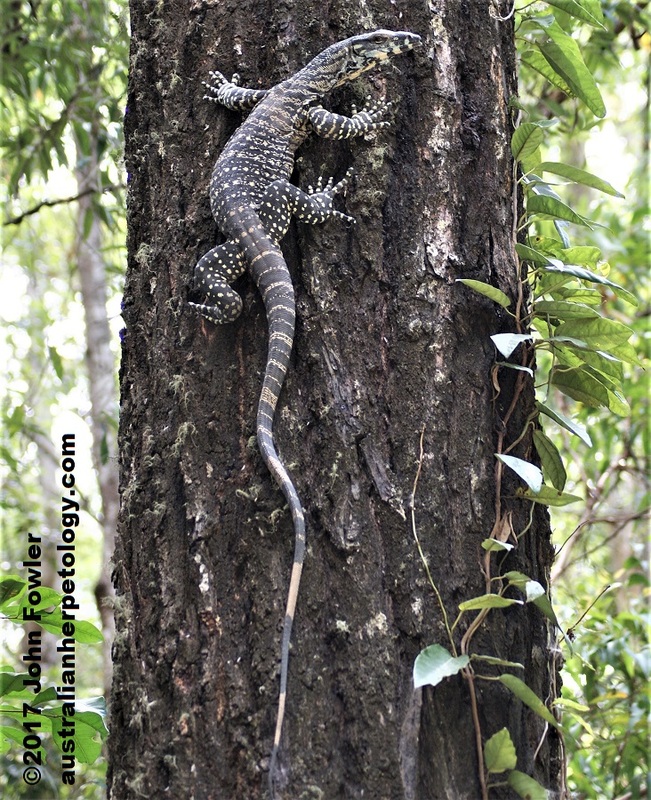 This half grown Lace Monitor Varanus varius was photographed at Venman Bushland National Park Qld. 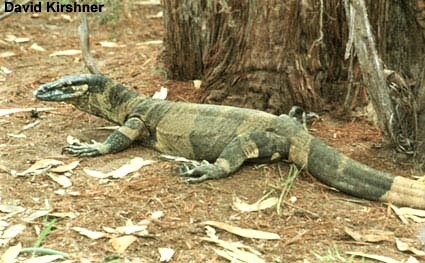 Notice the very long tail! 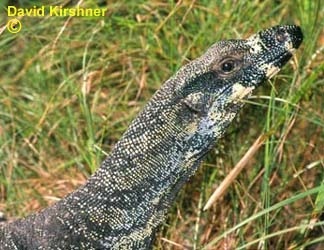 The Lace Monitor Varanus varius often has a" barred" pattern on its nose and throat and broad bands on its tail. 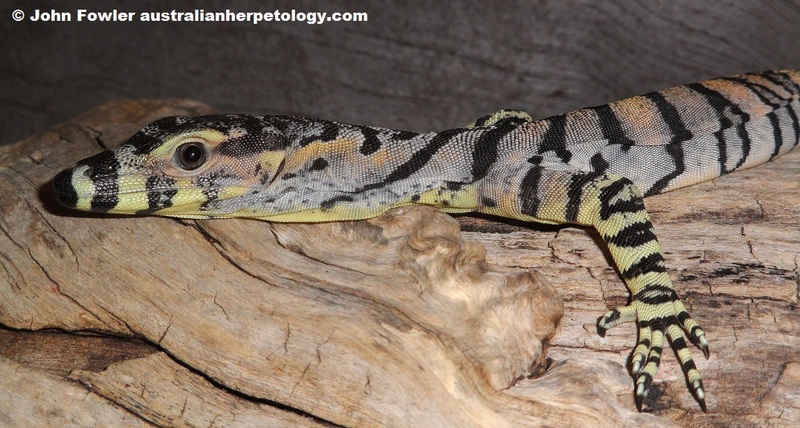 The following pictures are of the "Bell's" or banded phase of the lace monitor. 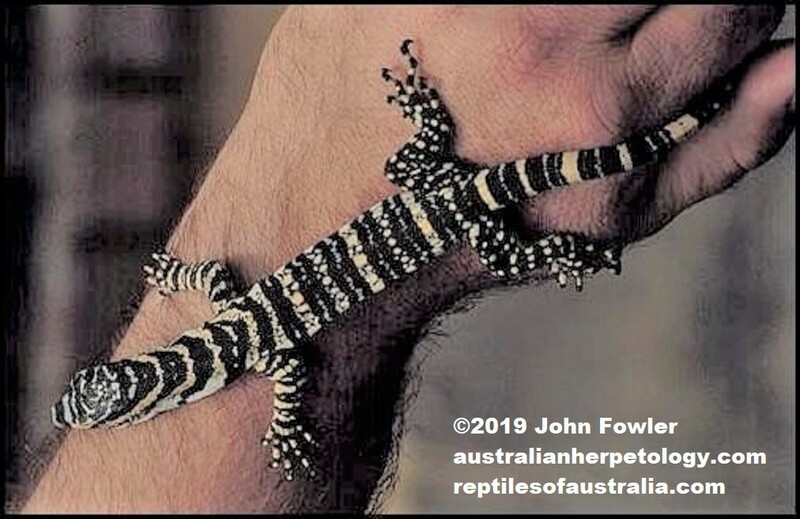 The bells phase lace monitors tend to be much more commonly encountered on the west side of the great dividing range. 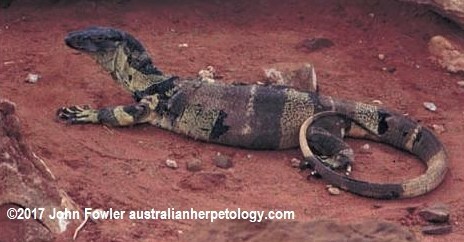 This form occurs alongside "normal" patterned lace monitors and will occur in the same clutch as normal lace monitors. 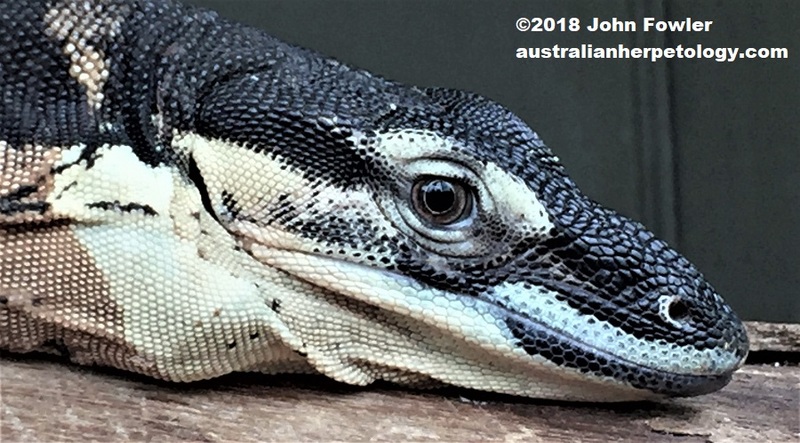 Although this photo of a "Bell's" phase of Lace Monitor Varanus varius is not very good quality, as it was taken at a distance from the boardwalk at Sea Acres Rainforest Centre, Port Macquarie, NSW, you can still clearly see its forked tongue. 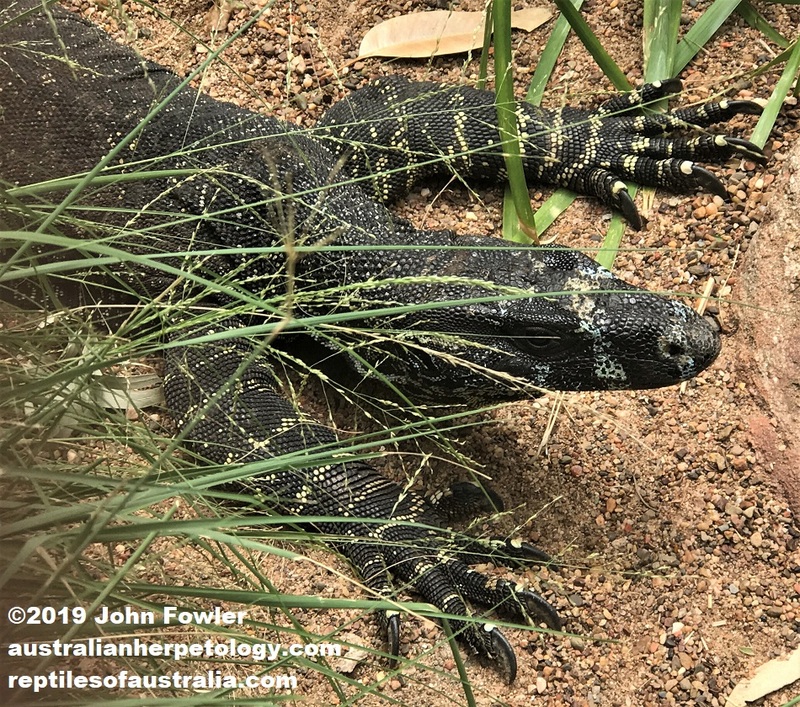 It is not unusual to see "Bells" phase Lace Monitors in this region where normal patterned Lace Monitors seem to be abundant.